The fruit fly – it spreads its wings far and wide inhabiting all the continents of the world, being a pest wherever it goes. The big problem with fruit flies is their astounding capability to infest buildings – be it a home, restaurant or business. Almost microscopic at 3mm long, fruit flies are drawn to over-ripe fruit and vegetables that might be found in kitchens or dustbins. While fruit flies are not directly harmful to humans, they will visit unclean areas and can carry dangerous bacteria, which they can then leave behind. The very worst thing about fruit flies is their stomach-churning capacity to multiply. The females lay their eggs on fermenting fruit and vegetables, then within just 24 hours they can hatch into maggots. This is certainly not a scenario you want in your kitchen or workplace. What can be done to get rid or fruit flies and to stop them visiting in the first place? The best way to avoid fruit flies paying a visit is to avoiding leaving overripe fruit and vegetables out – they also like alcohol so keep the bottle stop in! Keeping the kitchen area clean and bins emptied should also help to discourage them. In the event that you do suffer from an infestation, throw away any food that may have attracted the fruit flies and give the area a thorough clean. 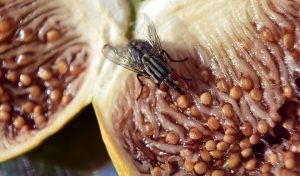 There are home-made remedies for attracting fruit flies away from food but, certainly in the case of a business, specialist fly deterrents should be put in place to prevent a future problem. Fly papers that catch insects, and fly-curtain doors are a great way to start. Larger premises may want to look at screening and electric units as a solution. Just a few simple steps should keep this pest at bay – and keep your fruit and veg safe. For more advice on dealing with fruit flies contact Pest Busters.